Chances are, at some point in your life you have had or will have to get a dental filling or crown. For many people, it is hard to justify having dental work done if they do not have a toothache. This is one of the biggest challenges we face as dental providers. It is our job to educate our patients why their recommended dental work is necessary, even if they are not experiencing discomfort. A tooth ache or discomfort in teeth is felt by the pulp, t he innermost portion of the tooth. The pulp contains living connective tissue such as nerves and blood vessels. When a cavity creates a painful or sensitive sensation, it has advanced through the outer layer of enamel, into the dentin and has either completely reached, or come close to, the pulp. 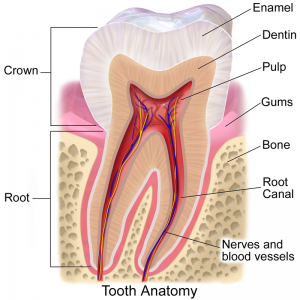 When a cavity reaches the live part of the tooth, it needs a root canal in order to save the tooth. At this point, the infection has reached the blood vessels and is at risk of creating a systemic infection. Root canals are more invasive and more expensive than fillings and crowns and, if an infection is severely advanced, a tooth may have to be extracted. If we are able to remove the decay before it has reached the living portion of the tooth and either fill the void or in some cases, crown the tooth, we are able to avoid toothaches, root canals and extractions. The quicker we get to a cavity, the less advanced it is and we are able to do a smaller restoration. Smaller fillings last much longer than larger fillings. As your dental providers, Adams and Cheek Dentistry will always show you decay on the radiographs we take. We also have intraoral cameras which enable us to show patients pictures of clinically detectable cavities. We will always diagnose decay and make appropriate treatment recommendations at the earliest possible stage. It is always your choice when you choose to get your dental work completed, but you should not wait until you feel pain (a toothache) to start your dental treatment plan. To read more about tooth decay, visit the American Dental Society’s Mouth Healthy website here. Please call us at Adams and Cheek Dentistry today at (919)866-1360 or click here to schedule online! PreviousPrevious post:Thanksgiving Dental Tips!NextNext post:Why do I have to take Premedication for Dental Treatment?